(1.4-1.6 in) in diameter; pericarpels and floral tubes covered with small scales, tufts of wool, and bristles. Fruits oblong, fleshy, becoming dry at maturity, with scales, bristles, and long tufts of woolly hairs. Distribution: Guerrero, Michoa-cán, and Colima, Mexico. 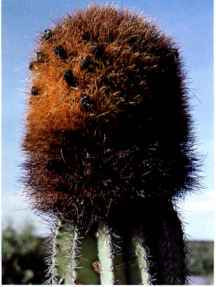 A greatly confused nomenclatural history exists for Pachycereus militaris, but it has been clarified by Sánchez-Mejorada (1973). 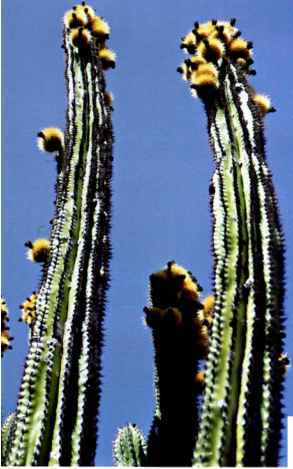 Pachycereus militaris is listed in Appendix I of cites. California Peninsula, Sinaloa, and Sonora east to the Isthmus of Tehuantepec, Oaxaca. 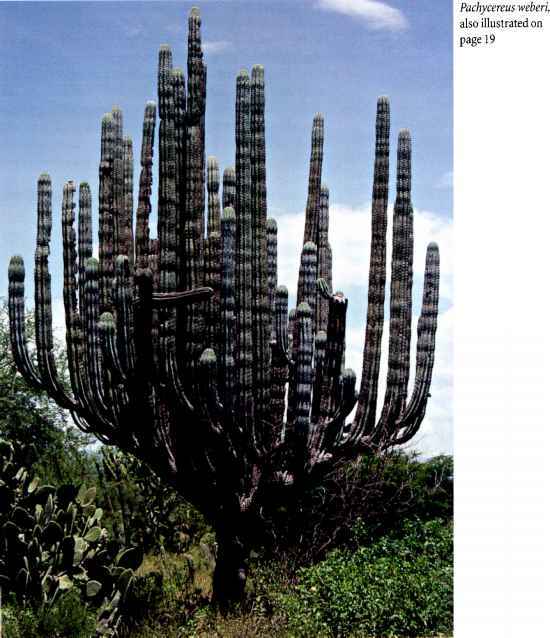 The ethnobotanical use of Pachycereus pecten-aboriginum is discussed in Chapter 2, under Cacti as Medicine, and Other Uses of Cacti (hairbrushes). cardon, cardon gigante, cardon pelon, sagueso, sahuaso Cereus pringlei S. Watson 1885, Pilocereus pringlei (S. Watson) F. A. C.
Plants treelike, columnar, branched, to 11 m (36 ft) high with well-formed trunks to 60 cm (24 in) in diameter. Stems erect, strongly fluted, blue-green to dark green, becoming yellow-green, 20-30 cm (7.9-12 in) in diameter. Ribs 10-16, obtuse. Central spines 1-3, grayish white with darker tips, to 3 cm (1.2 in) long. Radial spines 7-10, whitish to grayish, to 2 cm (0.8 in) long. Flowering areoles large, terminal, covered with brown felt, connected by furrows or confluent. Flowers open both at night and during the day, funnelform to bell shaped, white, to 8 cm (3.1 in) long; pericarpels and floral tubes bearing small scales with masses of brown hairs arising from their axils. Fruits globose, somewhat dry at maturity, to 7 cm (2.8 in) long, covered with yellowish brown felt and bristles. Distribution: Sonoran Desert of Sonora, Baja California, and Baja California Sur, Mexico. 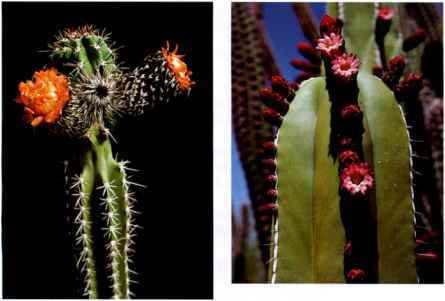 Fruits of Pachycereus pringlei are harvested by the Seri, stems are used medicinally, and containers have been fashioned from portions of stems that react to woodpecker holes (Chapter 2, under Cacti as Food, Cacti as Medicine, and Other Uses of Cacti). 1-3 m (3.3-9.8 ft) high, yellow-green, 5-10 cm (2-3.9 in) in diameter. Ribs 4-13, prominent. Central spines 1-3, stout, gray, 1-3 cm (0.4-1.2 in) long. Radial spines 3-15, gray, 0.51.5 cm (0.2-0.6 in) long. Pseudocephalia terminal, 5 cm (2 in) to sometimes 1 m (3.3 ft) or more in length, forming long brushlike masses of flexible gray spines. 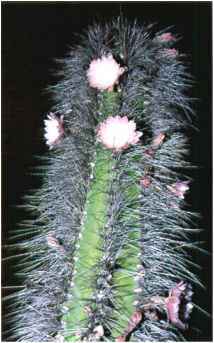 Flowers borne laterally on the pseudocephalium, open at night, funnelform, white to deep pink, to 4 cm (1.6 in) long, 3 cm (1.2 in) in diameter; pericarpels and floral tubes with scales and hairs. Fruits globose, red with red pulp, fleshy, 1-3 cm (0.4-1.2 in) in diameter. Distribution: southern Arizona, and Baja Cali fornia and Sonora , Mexico. 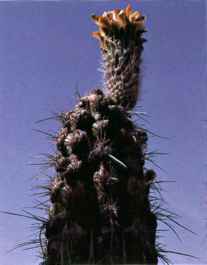 Several varieties have been described for what is now Pachycereus schottii, none recom-bined in Pachycereus and it is doubtful that they warrant recognition. 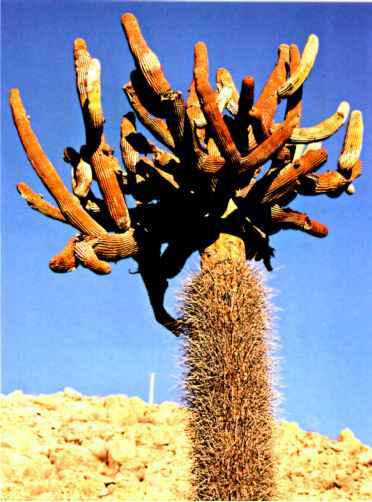 Fruits of P. schottii are tasty though they are not harvested as a crop (Chapter 2, under Cacti as Food). Plants treelike, massive, columnar to candelabra-like, to 11 m (36 ft) high, much branched from large trunks to 2 m (6.6 ft) high. Stems erect, blue-green, to 12 cm (4.7 in) or more in diameter. Ribs 8-10, rounded. Central spine one, flattened, blackish, to 10 cm (3.9 in) long. Radial spines 6-12, reddish brown to black, 2-3 cm (0.8-1.2 in) long. No pseudocephal-ium evident. Flowers borne laterally on the stems, open at night, yellowish white, to 10 cm (3.9 in) long; pericarpels and floral tubes with small scales and bearing long yellowish brown hairs from their axils. Fruits oblong, dehiscing often into four segments, pulp reddish purple, edible, 6-7 cm (2.4-2.8 in) long, with abundant yellowish spines. Distribution: Puebla, Oaxaca, and Guerrero, Mexico.